Well, its been awhile since I posted on this blog and I’m due for some major updates. I have been training like a mad man at my old stomping grounds, Hyde Park Gym and spreading the good vegan message through my continued success in lifting as I near age 50. Ten out of my thirteen of my personal training clients are now vegan and have all been gaining muscle as some, who desire too, have been losing body fat. To say I’m proud of them is a major understatement. I feel like my life goal of spreading fitness, longevity and a compassionate way of living through good training and a vegan diet have continued to develop. One of the reasons I have writing this post is to address the issue of this plant based diet. I have answered the same questions for my clients and others who are interested in the “correct way” to eat for muscle growth and fat loss. The answer is very simple. Its also really easy. A high speed blender to blow up a bunch of greens and fruit for breakfast and lunch and a gigantic salad or stir fry in the evening. Thats it. Every single person I have put on this plan has succeeded. This is precisely why I titled this article The Lazy Vegan. I still workout with high intensity three to five times a week to stimulate muscle growth, but the weight loss and nutritional support for growth is the easy part. I think way too many people freak out about nutritional timing, their fat to carbohydrate to protein rations with incessant meal planning and clock watching. 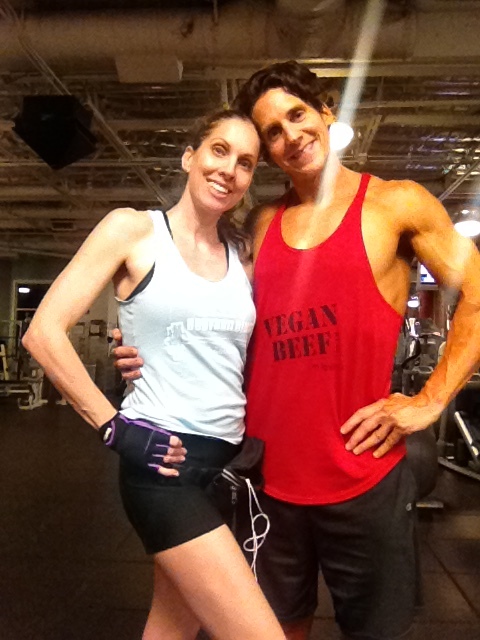 Having competed in over twenty body building shows Vegan and non-vegan, I can assure you that Eating fewer calories than you burn with high quality organic plant life is always going to work. No magic supplement. No magic food timing. No insane cardiovascular training. Just solid, natural food that doesn’t contain processed grains, fake sugars and unnatural chemicals. again, this is just a basic idea of what I and many of my clients eat most days. Just like workouts, diets are best when messed with. Don’t let yourself become bored with the same running plan, weight lifting program or exact dietary plan. Just as your body changes with training, so will your desire to eat new, interesting whole foods. The produce aisle is not intended to intimidate you to eat everything but to inspire your palette to experiment with new food ideas. The only things that need to stay consistent in your life of fitness are whole foods and intense workouts. If you want to know more about the training style that has helped me run two 100 mile races and win two 24 hour foot races, win my division in body building shows, a first place in my division at the World Kettlebell Competition and win one World and three American records in indoor rowing, check out my website and earlier postings on this blog. 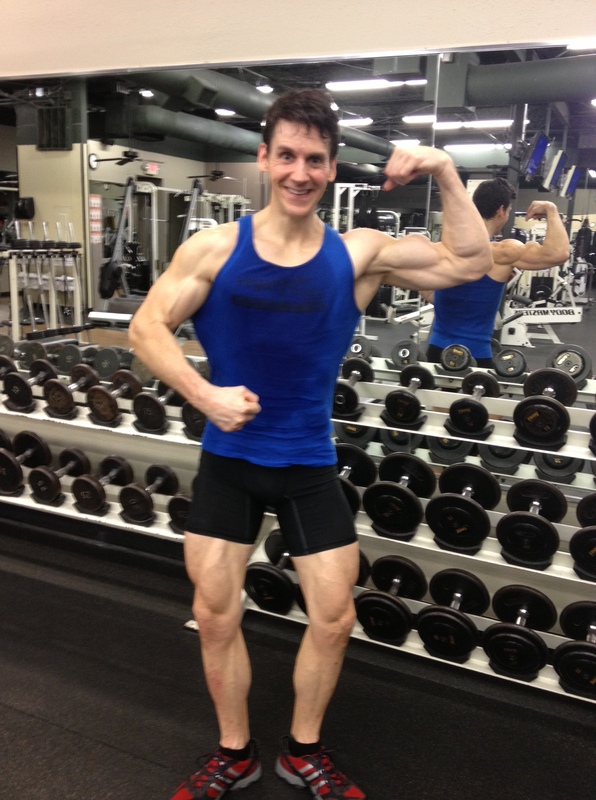 If you live in Austin Texas, please come by Hyde Park Gym and see where lean muscles are made. Working as and editor and photographer at Vegan Health & Fitness magazine, I travel a bit. Brenda Carey, the editor in chief as well as my awesome girlfriend just got back to my hometown of Austin Texas after a long 1250 mile drive from our apartment in Miami Beach Florida where we spent the last 8 months creating articles of amazing athletes there. After arriving at my place here in Austin and getting some quality sleep, I was eager to use the Concept2 rowing machine at my old gym across the street. I have been very close to a world record in the 500 meter distance (actually breaking the record by a decent margin in a heavier weight class). I finished 2nd last year at this distance in the world at any age (I’m 46 years young), and am currently in 2nd this year. 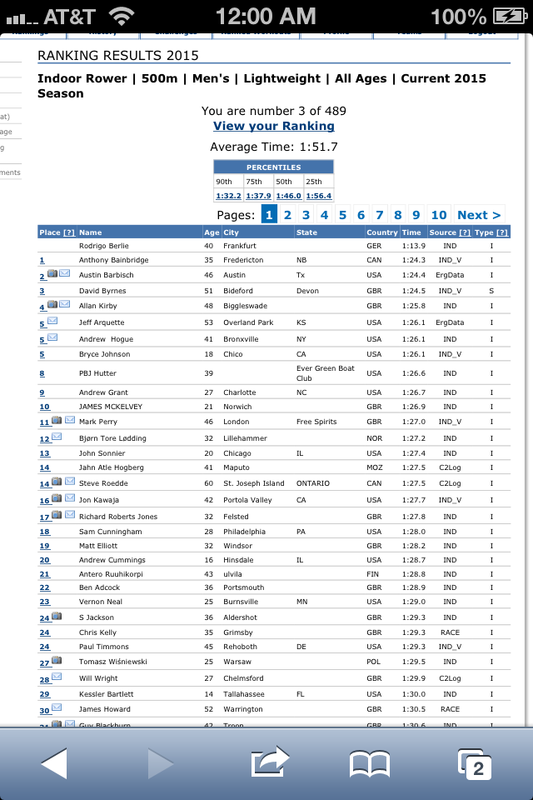 Concept2’s online ranking system compiles the rowing times and distances from rowing teams all over the world, so I am definitely playing with the big boys when I rank with these guys! Concept 2 recently added a new time (1 minute and 4 minute) and distance (100 meters) to their site and I was eager to take these shorter, more explosive challenges on. 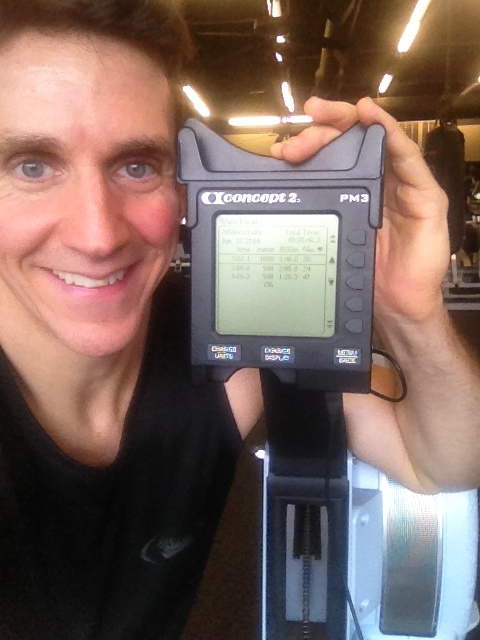 Just rowing 100 meters in 15 seconds flat to place first in the world at ANY age in the world (I’m 46) Vegan Power!!! Yesterday I ranked 1st in the world in the 1 minute time with 367 meters and, today, ranked 1st in the 100 meter distance in 15.0 seconds and 4 minute time (all three placements are for ALL all age groups)! Guess it’s time to attempt a new 500 meter world record soon. 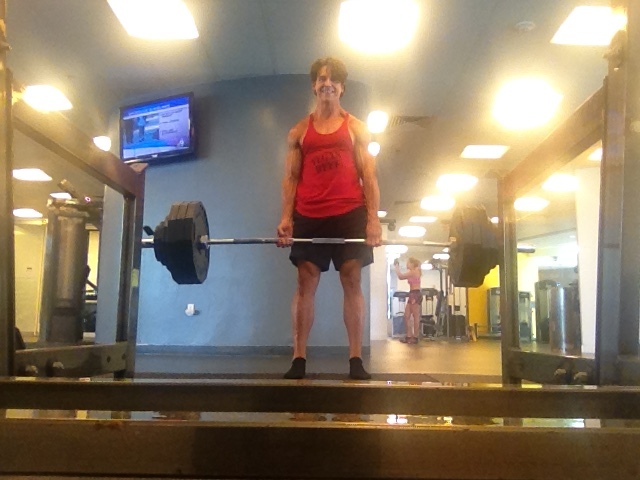 Completing my first dead lift “Selfie” picture! I had just 10 seconds to push the self timer and pick up 395 pounds ( my heaviest lift this year). 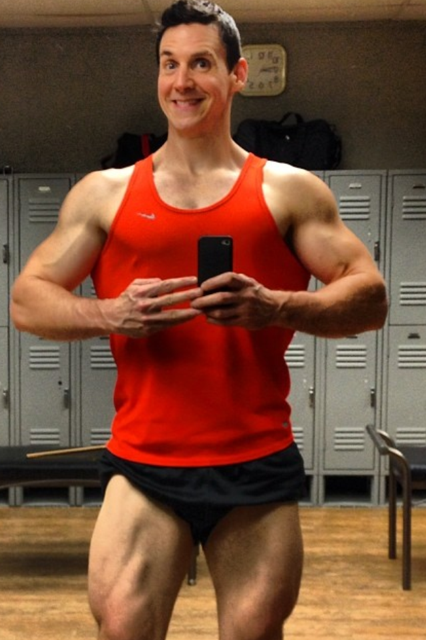 Looks like all of the Deadlifts, Leg presses and upright rows at the gym over the past 28 years has paid off! I have lifted weights and rowed for the last three days and feel terrific! Update: Just broke my Deadlift PR of 385 pounds for 3 reps, 365 pounds for 7 reps and finishing with 315 for 16! Life is good when you are vegan! I had such a great time at the Naturally Fit Super show, winning my class, and getting to see our PlantBuilt team do such an amazing job showing the audience and other competitors how a vegan diet can create amazing, show winning physiques. 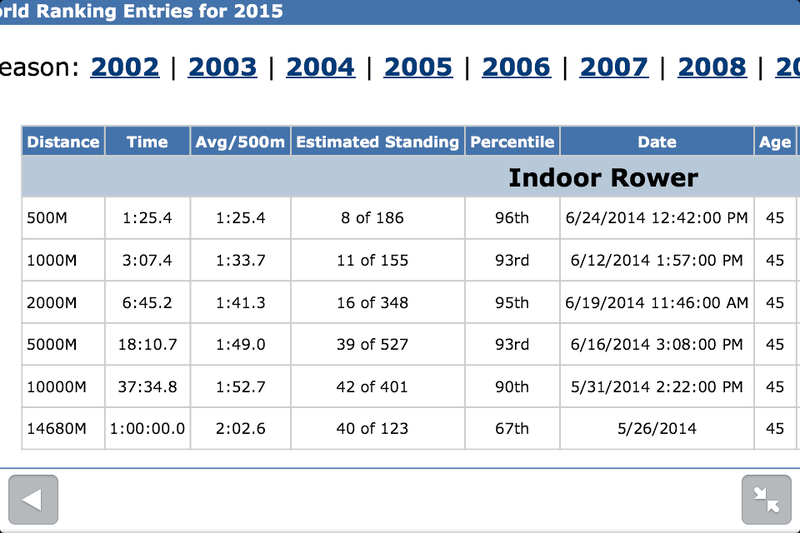 Now, it was time to continue my quest up the indoor rowing ranks. 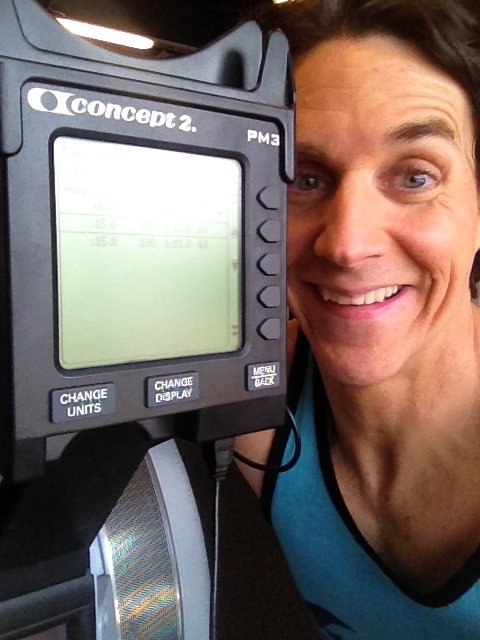 The concept 2 rower has now been the main focus of my gym workout. My girlfriend Brenda has also gained interest in this sport, so I officially have a training partner. I decided to continue my diet from the last bodybuilding show (when I weighed about 176 pounds) to a new goal weight of 165 pounds in order to compete in the light weight division, managing to hold the seasons world best time in the heavyweights for about two weeks in my age class, but know I will be a lot more competitive in this new Lightweight class. I’m currently 1st in the 1000 in the world at any age group (I’m now 46 years of age). The world record at this distance for my age group is 2:59, and I am currently at 3:09.2, so I still have a bit of work to do. The Lightweight 500 meter distance is where I seem to be more competitive. 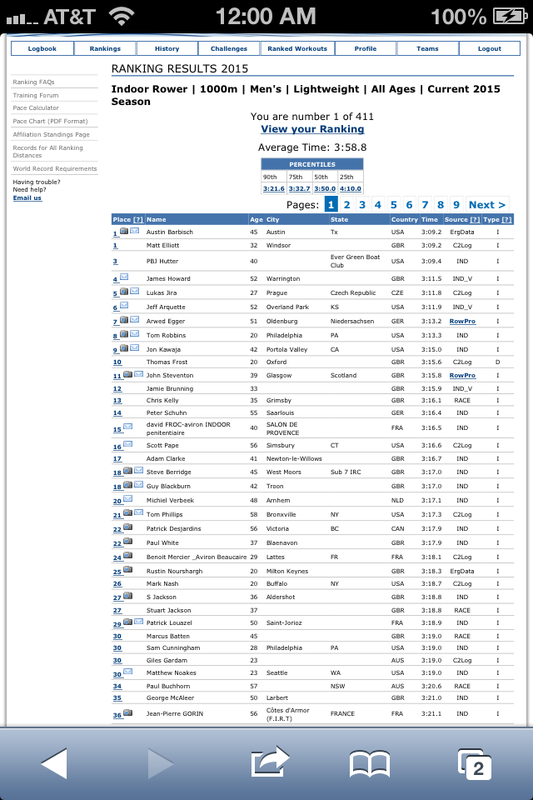 I’m currently 2nd in the world at any age and just 1 second away from beating the world record in my age class set in 2009 by an olympic silver medalist. I beat this time by .3 of a second when I weighed 172 pounds, but have been gaining my power back since making the lightweight class. I’m really looking forward to getting this 500 meter record, so I can start getting my body mass back for another round of heavy gym lifting. Yippie!! 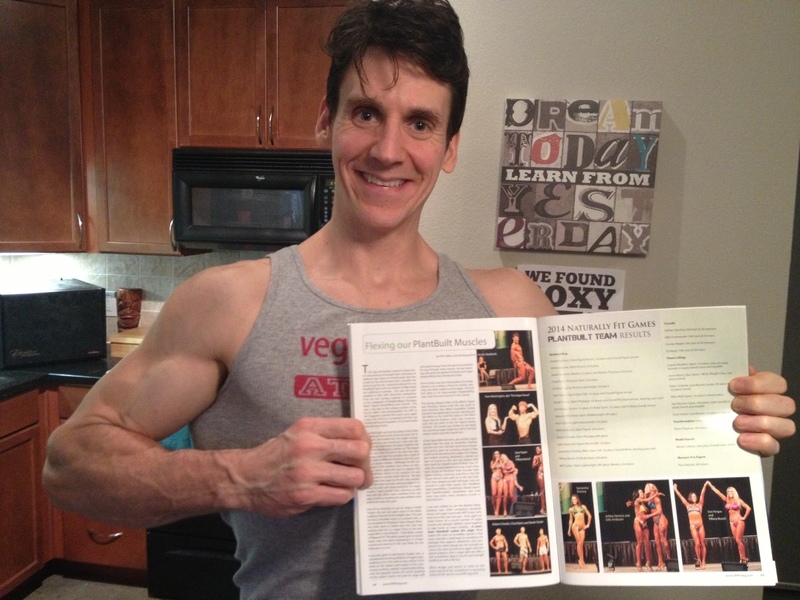 Looks like I will be moving to Miami with Brenda and Vegan Health and Fitness Magazine in February! also, in England for a 9 day (969 mile) bike ride, speaking at some UK Veg-Fests along the way in April as well. Yay!! Bring it!! Vegan Power!!! My skill level in “on-the-water” rowing continues to improve, but my true talent is in the sport of “indoor rowing,” where my performances are really becoming competitive. I’m currently ranked third in the 500-meter, fifth in the 1000-meter, second in the 2000-meter, and eighth in the 5000-meter distances in my class in the United States and climbing the ranks. I am currently dieting for the PlantBuilt show, where I will share the stage with 31 other vegan athletes, but will likely continue to diet down after this show to an even more competitive weight class of 165 pounds for indoor rowing competition. I am currently 181 pounds and have been competing against larger athletes well above the 165-pound Lightweight cut-off (usually 200-230 pounds) and taller than my 5’11” height by three to eight inches. Just being in the 92-96 percent bracket with these guys is very rewarding, but in the lightweight class, I would be in first in the 500, first in the 1000, and second in the 2000-meter in the world in my age class. I would also be only 1.9 seconds shy of a world record in the 500-meter distance currently held by an Olympic silver medalist! ( My best time as of 6/23/2014 is 1 minute 25.4 seconds. Current world record is 1 minute 23.5 seconds). I have about ten pounds of body fat to lose and can dehydrate three pounds without sacrificing my performance, so might be looking at a three-pound loss in muscle to reach this body weight goal. Being a die-hard natural bodybuilder for the past eighteen years makes the idea of muscle loss difficult, but this goal has been haunting me. There is also an indoor rowing event held every February called the C.R.A.S.H.-B. Sprints World Indoor Rowing Championship. This competition brings some of the best rowers in the world to Chicago’s Boston University Agganis Arena to duke it out on the same Concept 2 machines that I have been training on, and will continue to train on for this event. Everyday brings a stronger motivation to push my body to a higher level. I’m living in the moment much of the time, but find myself slipping into the future, wondering what cool things will unfold before me. My current world ranking in the heavy weight division. I’ll be much more competitive when I move to the light weight division. It’s now only five weeks until the PlantBuilt team of all-vegan competitors hits the stage in my home town of Austin, Texas. 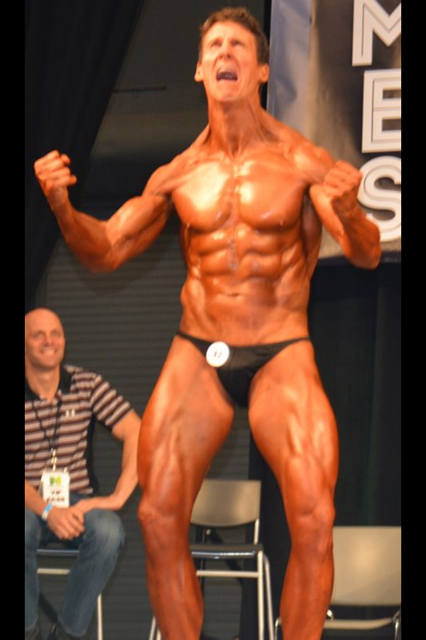 Last year our team dominated the Naturally Fit Bodybuilding Show. Our 15-person team really shined against the other 150 non-vegan athletes, winning two pro cards for overall wins, as well as many second- and third-place trophies. I won two second-place trophies, losing to another vegan competitor in one of the categories. This year brings a team over twice the size, with a total of 32 powerlifters, bodybuilders, and figure, bikini, and physique competitors. This is the largest gathering of its type in history, and I’m proud to be one of these lucky members. I’m currently busy dieting for this event, with about six more pounds of fat to shed in the next five weeks. Rowing has been my main cardiovascular exercise, because this movement uses the entire body, burning a good amount of calories in a short time, and relates to a sport (indoor rowing) that I will continue to pursue after this awesome event. I’ve been competing in bodybuilding since 1996, so the number of shows I have completed escapes me (I believe this will be the fifteenth), but I’m still just as hungry to win, especially with such a good cause powering every repetition of every set of every workout at my gym. Since I decided to go vegan, every aspect of my life has improved, and I’m eager to help break some of the stereotypes commonly associated with plant-based people. We are not pale, unless we stay out of the sun–just like everybody else. We are not skinny unless we don’t exercise–just like everybody else. I can’t tell you how many times a person from my gym has told me that I need to eat a steak, as I stare at their less muscular, higher body-fat physique. Really!? It’s going to be terrific to see my team again–members who are coming from all over the United States (a few from Europe) to prove this point as well. It’s also going to be great to meet the eighteen new teammates who were voted in by last year’s team members. I will also be busy photographing many of the events and stage action of the PlantBuilt team for Vegan Health and Fitness magazine and am honored to be on the cover of the July/August issue covering multi-sport athletes. I’m also actively writing a book about my life from sedentary fat kid to motivated athlete, sharing stories of my painful mistakes and lessons learned in order to reach a higher level of fitness and overall well-being.